Chances are if you’re looking for some quick-adjust dumbbells, you’re seriously considering the Bowflex SelectTech 552 Adjustable Dumbbells. Well we’ve got you covered in this review. We’ll start by saying that if you’re someone who likes to drop their dumbbells after a set, and you’re not willing to change your ways then these are not for you. If, however, you like to take care of things that cost you a few hundred bucks or more, then read on because you might just like them. These dumbbells come as a pair, so you don’t have to change the quantity to two if and when you purchase them. With that out of the way, let’s get into the review! Many people look at the Bowflex SelectTech dumbbells to use when completing a program like P90x, where you have to quickly move from one exercise into the next, often changing weights as you go. Well, while they aren’t perfect, these are possibly the best adjustable dumbbells for that purpose. The SelectTechs have a really great design. Being able to adjust the weight of the dumbbells in 2.5 lb increments by simply turn a plastic dial at each end of the bar is very very clever. 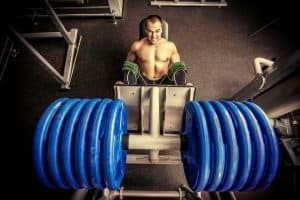 It means that with two dumbbells, you replace a large number of fixed dumbbells (e.g., hex dumbbells) or a huge amount of the weight plates that accompany traditional adjustable dumbbells. That’s why these are definitely suited to people who are short on space at home, or looking to have some weights they can use in an office at work. They look super-cool too. You won’t be disappointed with how they look in your workout space. 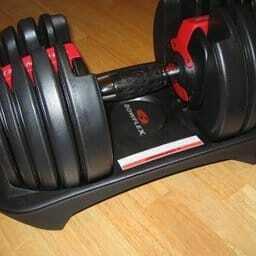 The black and red dumbbells with the black base plate is very stylish. The design is great, but the quality doesn’t quite match. There’s a lot of plastic on these. The weight plates themselves have a hard plastic covering, as does much of the quick-adjust mechanism on the handle. Not only should you not drop these, but you really shouldn’t let them get knocked about at all because the plastic will dent or break. Plus, unlike some alternative quick-adjust dumbbells, like these Ironmasters, the warranty on the SelectTech 552s isn’t particularly long and may not be valid once the natural wear and tear to the plastic components starts to kick-in. Also, the clips that hold the weights onto the handle are a touch fragile, and if they get damaged and break then the weight plates will fall off, sometimes without warning. You don’t want to be holding these above your head when that happens. Yikes! They are long. Sixteen inches from dial to dial makes them a bit unwieldy, especially if you’re short. 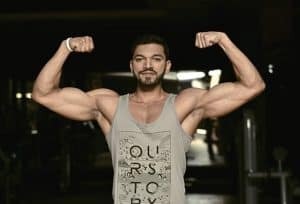 With some exercises (e.g., front shoulder raises, shoulder presses, chest presses, and triceps kickbacks) they are so long that they can compromise your form, which is always a bad thing. The dials that you turn to adjust the weights can get stuck. This seems to be a fixable issue, just have a read through this Fixya discussion. When putting the handles back into the mount to grab more weights, or when adjusting the weights and pulling the handle back out, you can occasionally get stuck on the remaining plates. This can significantly increase the amount of time it takes to adjust them, which kind of defeats the purpose of these. That said, it usually just requires a bit of a jiggle to get it working smoothly again, and we think you’ll get the hang of fixing this quickly when it happens. The weight plates are not completely fixed on the handle, and so they jiggle a little during repetitions. On the one hand, this is off-putting while working out. On the other, you will get used to this quickly and it’ll stop being an issue. Look, when these work well, they’re awesome. However, they can develop some annoying quirks. In the end, they’re a fairly unique and innovative product. Therefore, you need to take good care of them, and give yourself a fair chance to get used to working out with them. Once upon a time, the Bowflex SelectTech 552 Adjustable Dumbbells were possibly the most expensive quick-adjust dumbbells on the market. But not anymore. They are going to set you back at least a few hundred dollars, but here’s the thing: We think they’re the cleverest and neatest quick-adjust dumbbells around, and as we said, when they work well, they work really well. For that reason, they’re good value. Overall, we believe that if you are willing to look past some minor quality issues, the Bowflex SelectTech 552 Adjustable Dumbbells are well worth the purchase. They’re unmatched in speed and ease of weight changes, they’re very good-looking, and they have a massive range of weight options. Also, straight out of the box their max. weight is heavier than comparable quick adjust dumbbells. While they’re not exactly cheap, they are certainly not the most expensive adjustable dumbbells around. 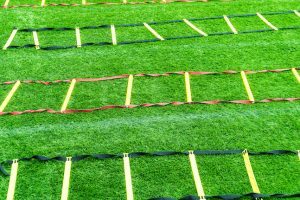 In any case, as with any good exercise equipment, if they help you get or stay fit, strong and healthy, then they’ll save you a ton of money in the long run and they’ll totally be worth it. If you’ve decided that these are the dumbbells for you, you can get the best price here. 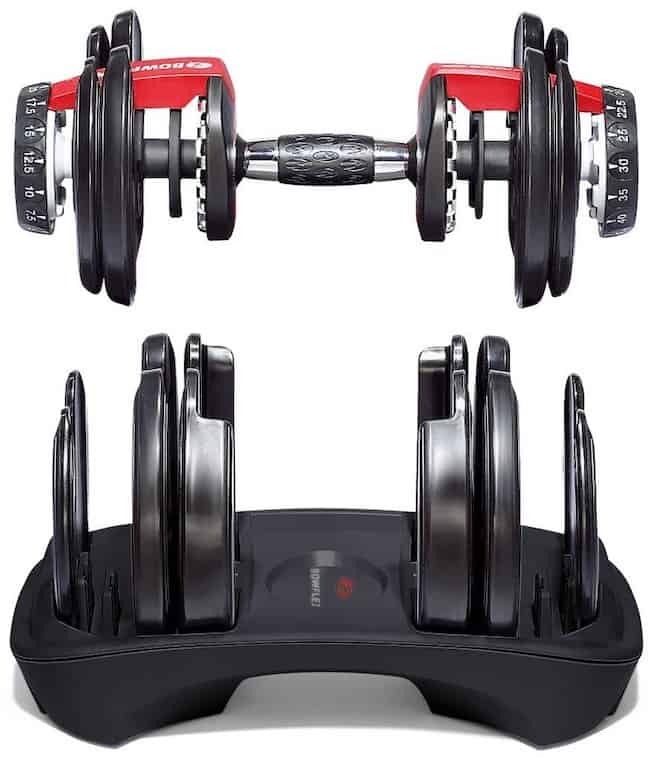 Bowflex also make a SelectTech 1090 Adjustable Dumbbell (as a single or a pair) that have a range of 10 – 90 lb, in 5 lb increments. 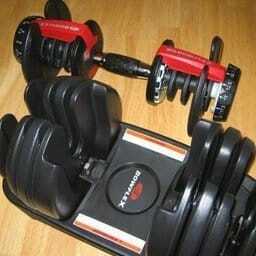 If you want these heavier dumbbells, you can get the best price here. Leave any questions or comments you have in the comments section below. As always, all the best with your home workouts. Remember – When it comes to our health and fitness, we can make the effort or we can make excuses, but we can’t make both!